- Special skills or programming knowledge are not required! - More than 1 000 000 000 000 000 of possible combinations!!! If you’re looking for an advisor or the way how to earn stable with minimal risks we are glad to present you our Client Account Management service. As it was written earlier here, our team has great experience in client Account Management and PAMM Account Management. Personally I worked a few years ago for the company, controlling big PAMM accounts. 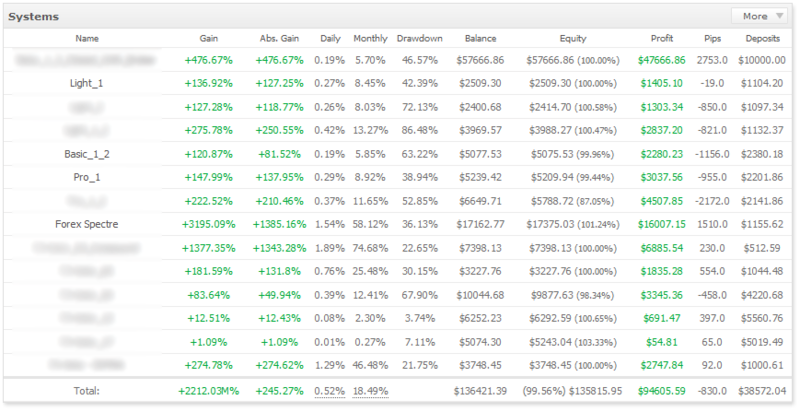 For stable and safe trading you need profitable and approved portfolio of advisors/trading signals. Exactly this kind of portfolio can decrease and limit the risks from 5% to 15% of your deposit and at that having decent profit. Such approach allows us to earn stable and without big risks and even in cases of force Majeure on the market we still will have many possibilities to return the losses and earn more. This is the way how investors’ money management in major hedge funds (investing companies) is carried out. We apply individual approach to every client and his deposit using only those systems which will be the best for you. Usually it uses from 3 to 8 systems on one account and the profitability varies from 5% to 100% depending on clients wishes. Our main rule is to secure your deposit.